Just because a practice is a “tradition” doesn’t mean that it ought to be preserved for the next generation. Tradition that represents ways of life that were, and still are, bigoted, for certain, need not be passed on. Flying the Confederate battle flag, especially on federal and state government lands, is one such tradition that ought to be allowed to die. Let us first get clear on what we mean by tradition. Typically, when we speak of “tradition,” we are referring to a set of beliefs or customs that is passed down through generations. We also use the word to describe different religious groupings or theological frameworks. For those of this tradition, these ideals are worth maintaining for generations to come. That the Civil War was about upholding these traditions makes sense. Except, these aspects alone are not worthy of war. What they leave out is the institution of slavery. Keeping slavery, the ownership of human beings for the purpose of manual labor and other dastardly deeds, was worthy of 750,000 lives given in the Civil War. Keepers of this tradition continue to fight a war that has long ended. It makes sense to me that Confederate flag supporters persist in their fight to fly the flag. Why wouldn’t they? Their forebears had immeasurable determination to fight on in the war well beyond the point when the cause for which they fought was lost (when Atlanta was lost in late 1864). The Confederates refused to surrender even when their soldiers were fighting with no food to eat, no supply lines, and places to lay their heads. This soldier illustrated a sense of purpose only the truly determined ever possess or know. Modern supporters of the Confederate flag have inherited this determination. They will fight to keep up the flag until the bitter end! The problem is what the defenders of Confederate tradition do not name: the institution of slavery. They skirt the issue of slavery. If you listen to the rhetoric of the defenders, you never hear the “s” word in their defense. I spent time in conversation recently with a gentleman, Lauris Jon Lee, Commander of the Private Henry L. Wyatt Camp 1297, of the Sons of Confederate Veterans (SCV). A warm and delightful person, Mr. Lee discussed with me what the SCV stand for at length when I stopped by the booth they have at the NC State Fair. While acknowledging the evil of slavery, he did not acknowledge that Confederate tradition included the way of life afforded his ancestors by the institution of slavery. Instead, he cited the tariffs imposed by the U.S. government in the 1830s to support manufacturing in the North as the primary cause of the war. Accordingly, those who fought in the war were defending the South’s right to pursue its economic interests. The SCV members, he stressed, do not promote racism, hate, nor other forms of bigotry. I imagine that there is some truth in that claim. I presented him with an alternative view of the war causes, its lingering effects on U.S. history, and my perspective on how our nation honors other war veterans, including veterans of wars lost. I also tendered the perception of the Confederate Flag held by many people of color and whites who stand in opposition to the flag flying in the public domain. For those who oppose it, the flag is a symbol of great oppression, pain, and injustice. Then, I sent him via email scholarly documents supporting my position, including excerpts of Pres. Lincoln’s letters. My position is based on historical records, not tradition. Though emotional about this subject, I let the facts speak and maintain a willingness to be corrected. I refer to emotion because it is clear that emotion and prejudice influence those who insist on upholding Confederate tradition. A case in the town nearby illustrates this point. In Hillsborough, NC, a Canadian-born, travel agent turned political aspirant, Cindy Lee Talisman, is defending a tradition as if she were borne into it. Running for a council seat, whose single issue turns out to be whether to preserve a Civil War memorial and hotel, she says, “The Civil War was about so much more than slavery. Slavery just happens to be an offshoot that people have focused on.” Say what? She needs to get her facts in order. And how does a Canadian-American grow to defend the Confederacy? 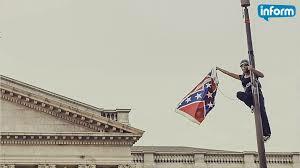 Bree Freeman bringing down the Confederate flag at the SC statehouse. Ms. Talisman, like others, is simply on the wrong side of history. Just as the State of South Carolina voted to remove the Confederate flag from its Capitol building and the University of Mississippi ruled to remove the state flag from its grounds due to its Confederate symbology, so should others get on-board with the times. The Civil War ended in 1865. The Confederate military lost the war. In its wake, slavery was constitutionally abolished, the union was restored, and Confederate soldiers granted leniency by Lincoln. With that ending, Confederate tradition was rendered a relic. Though Confederate tradition may live on in the private lives of its benefactors, there is no place for it in the public square. What we need now are traditions that encourage unity, common language, and shared experience. We should lift up traditions that make us proud to be Americans. Bill O’Reilly & Martin Dugard, Killing Lincoln (New York: Henry Holt and Co.), 47. Being a seminarian was a real treat. I met people who were totally on fire for God! By “on fire” I mean that they were ready to get out there and preach “the word.” These classmates were impressive in their passion. Unlike them, I primarily wanted to study pastoral counseling and figure out my future from there. I’ll never forget spending hours at a time in the library at Perkins School of Theology (and later Brite Divinity School) reading books of the Bible for my bible class, the seminal course for entering seminarians. It was easy to get lost in the text as I discovered all of the verses that I’d heard many preachers and friends use as though they had secret kernels of knowledge. “All things happen for the good…” from Romans 8.28 is a good example. I had discovered the keys to the universe! I’d leave the stacks feeling tall…full of knowledge, full of myself. [That was no way to be!] Soon, I was wondering why didn’t everyone get to have this marvelous educational experience. Why wouldn’t they since everyone was Christian? Right. Not! One day, I woke up and realized that I was living in a Christian bubble. Constantly being around seminarians, seminary professors, and church folk had severely colored my world. Everyone wasn’t Christian nor were they trying to be. This wasn’t news to me since I grew up with an atheist parent. But, it was an awakening in the sense that I realized how easily you can work yourself into an insular environment and never know it. You begin taking for granted that everyone shares your belief system, you and your inner circle all have the answers, and outsiders be damned. Luckily, I awakened from that slumber and got real with myself. With this in mind, I finished my degree in four years from the beginning and was ordained, shortly thereafter. My awakening didn’t damper my learning process. I “applied” myself, as my mother would say, and got ‘er done. I had learned to live with ambiguity; the both-and equation. That is, both everyone is not Christian, but I am, and I need to finish this degree and move on with this career that I started. So, I did. Later, I awakened, again, and realized that I was not a Christian, although christian. Seminary liberated me to be my own thinker. That in itself was worth the ride. But, it also helped me find my passion: teaching and learning. I remember an important episode that demonstrates this. I had fallen in love with liberation theology, especially the work of James Cone, as had many other black seminarians who took an ethics course. Prior to that, I hadn’t realized that Jesus was a brother! I loved this text; still do. But, I gradually realized that Cone and his black liberation theology cronies had no more authority than anyone else to determine the essence of Jesus’ ministry or what the Bible or any other sacred text stands for. They are not the sole arbiters that their writings suggest that they are. While their work was liberating and spoke volumes of truth to me and others, I was free (like you are) to reject their conclusions like I’ve rejected many others. Hence, I pretty much said, “hasta la vista” to that theology as my primary way of doing theology. I opened myself up to a more inclusive and complex understanding of scripture and theology. More importantly, I had critically thought my way through a quandary. That form of liberating thinking has stuck with me. That is, I continue to strive to see the world more clearly and as unobstructed as it may be. I’m unafraid of naming false truths, seeing through mirages of truth, and speaking truthfully myself. This is the basis of my forthcoming book, Mastering Your Own Faith. You need not be compelled to accept other people’s religious or spiritual truths. You do need to learn to find your own spiritual and/or religious path or scientific/humanist path or whatever path you claim, then stand by it with all your strength and might. Yet, allow others to do the same. Try not imposing your views upon others. And as your views evolve, be open to future that such views might guide you. By embracing the new future that seminary offered me, I did find my way. It was a long journey. There were 11 years of hard work earning two degrees. It changed me. It changed the people around me, too. I lost some friends, but gained others. I am thoroughly grateful for the experience. The future remains open. I continue to embrace the change that is forthcoming. I hope that you do, too. Going into “the ministry” is no small endeavor. I wasn’t expecting a call and didn’t really get one in the traditional sense. Rather, I chose the path of ministry as I chose other vocations in my past because I knew that I had the gifts and experience to be a minister. I was drawn to the academic side of ministry first. The pastoral calling came afterward. Making this confession feels empowering now because when you approach ordination boards and committees, they want to hear the more fantastical aspect of your call: the “burning bush” moment when God spoke to you by name and said, “Who shall go for us?” Then, you say, “Here am I. Send me.” As it turns out, I sent myself! When I was laid off by the railroad in 1996, my immediate inclination was to return to another position in corporate finance. It seemed the natural thing to do with the education and experience that I had accumulated. Had it not been for an encounter with a wonderful man, named John Winham, who helped me understand that I could redirect my passion for religion and powers of critical observation and thinking and use them for a career in ministry. He discerned this in me during a couple of conversations we had during breaks at a “job transition” seminar. I’ve learned from that experience that it is not always the quality of the advice we receive that makes the difference in our lives, but our ability to receive and execute what we’ve heard. I could have easily dismissed his counsel and gone my way. But, over the years, I had developed the capacity to take people’s advice and running with it. When I heard John’s encouragement to consider seminary, I knew he had read me well and I could trust his discernment. Within a month, I was a seminarian, starting life anew. Using the metaphor from the book, What Color is Your Parachute, I realized that my parachute’s color had changed. It was time to move on to a new life, a new me, a new future. I arrived at seminary amongst people who were driven! Most had dreams of becoming a big preacher with a big church. I just wanted to learn a few new things. I was ready to go where the hot air took me…up, up, and away. And away I went. Being a student of Dr. Bailey and Dr. Holmes had prepared me to think critically about the world, especially about faith and the spiritual life. Being in seminary helped me learn how to think academically and with structure. I learned how to craft and develop my mind on deeper levels. Working my way through two seminaries and two degrees helped me write and tell stories and integrate my studies into my real life. In other words, I learned to integrate theory with practice. When this happens, we’re talking about praxis. I wish that I had learned this earlier, but I learned it when I was able to. While I learned a lot in early degree programs, I didn’t quite put together the learning with the living. My graduate seminary studies helped me make the connection. There was another vital link that I cannot leave out concerning this theory and practice connection: clinical pastoral education (CPE). This is the name for chaplaincy training in hospitals and other secular institutions. Training in a hospital is all about growing into one’s identity and authority as a minister. You work with a chaplain supervisor and your peers to work out your personal issues. This work is imperative because your personal issues get in the way of your own personal goals and ambitions. Your issues are a hurdle that, if mastered, can become an asset for your personal freedom in the world. The most important issue for me was anger. I walked around angry all the time. In particular, I was distrustful of white people, who I felt treated me disparagingly due to my race. Two experiences helped me get over anger. It happened totally unexpectedly. The first was a trip to Clark Atlanta University for a job. I thought I had nailed the interviews. They never even sent me a rejection letter. Nada. I learned that even black people could treat me disparagingly. More importantly, people can treat you ways that are confusing and you may never know why or what you could have done differently. So what is the use of being angry for such experiences. They are beyond our control. The second thing was reading a book called The Skilled Pastor, which had long chapter on rational emotive behavioral therapy and how we can be caught up with irrational thoughts. I had a few that I needed to let go. I thought too highly of myself and was easily angered, for example. I decided to take this irrational thinking for what it was, irrational. Then, let it go and act, otherwise. My anger evaporated into thin air. From this point, my life was so much more open to what life had to offer. Without anger pulling at my heartstrings, I was free to be. But, there was more to come. I’ll pick up with more in the next post. Curious minds want to know: how did you become a Unitarian, and what do Unitarians believe? And black Christians ask me: do “they” believe in the Bible? These are all excellent questions. Quick answers: It was a process; we believe that love can transform hearts and the world, that right action (orthopraxis) is more important than right belief (orthodoxy); and the Bible is a sacred text written by humans, not necessarily inspired by the Holy Spirit. Now for a longer answer to question #1. I became a Unitarian Universalist as consequence of many experiences, processes, encounters with wise people, and pushing the boundaries of my imagination with regard to faith and religion. When I look back now, it seems ingrained in my DNA having a very religious mother and a not-religious (atheist) father. My friends, also strong sources of influence in my life, have been mostly religious. The mixed religious upbringing opened me up to diverse perspectives, and most importantly, allowed me to witness two very different human beings live successful lives. Born with a cross-section of religious impulse flowing through me anchored my curiosity in the world and gave me a safe place to explore. As a child, I never frowned upon my dad’s disbelief, although I did find it odd for him to be so adamantly against teachings about God and Jesus. He’d get fired up (angry) espousing his disbelief. As I got older, it became clear that living without God was no hamper to him being a good person. With a devout A.M.E. mother, I was swayed to her side of the religious coin for most of my life. Gradually as a teenager, it dawned on me that I wanted to explore churches that weren’t A.M.E. and I also wanted to depart from my mother’s company on Sundays and do my own thing. My mother offered no dissent, so off I went…to the Baptist church. That was the beginning of an interesting journey, one from which I’ve never departed. Between adolescence and adulthood, I have been on the religious wagon and off. Both were satisfactory, believe it or not. Yet, when I wasn’t attending church, I felt restless. The religious impulse did not entirely depart from me. In my late 20s, I became engrossed by a liberal & persuasive United Methodist minister, the Rev. Barry Bailey in Ft. Worth. His sermons were often counter-cultural or counter-interpretative, meaning his interpretations of scripture and understanding of Jesus’ ministry was a strong departure from the traditional preaching I’d heard before then. Using sacred text and interpreting it through a lens of open-mindedness and critical thinking, he demonstrated that conventional perspectives of Jesus’ ministry were open to challenge. So off I went, again. I was never able to return to more conservative approaches that demanded only one way of understanding the Bible. Later, I was thrown another curve from the liberation theology tradition through the sermons of the Rev. Zan W. Holmes in Dallas. I felt that I had the best of both worlds hearing his political-oriented, soul-filled sermons and Bailey’s fresh thought. But, Holmes brought the black struggle up-close-and-personal in a way that I’d not experienced from a preacher. He showed how faith and real life converged through the liberated “word.” He espoused political involvement, social action, education, and devotion to the struggle of people of color. He was the first preacher that called white people “white brother” and “white sister.” That was very cool. Both of these ministers preached to middle-class congregations. That opened my eyes to class in the church. My Baptist experiences, though very satisfying at the time, were grounded in the working-class experience. While the Baptist ministers might have been educated (usually in bible colleges), there was no encouragement from them to the congregation to read or study beyond the Bible, to challenge the status quo. I began to witness a built-in type of oppression in an otherwise liberating gospel message. This was disheartening for me in a big way. At the time, I could not put the observations in words. It was hard because I lacked the evidence beyond my own intuition and realized that most of my friends were attending those churches. How could I indict their experience, yet remain a friend? About this time, I stumbled upon National Public Radio (NPR). The fantastic programming, such as “Fresh Air,” “The Diane Rehm Show,” and “All Things Considered” expanded my view of the world immensely. I realized the world beyond my small world was rich and full of big thinkers and doers. If I was going to be a religious person, my faith had to make room for this perspective on the world. The news accounts and commentators opened me up to books, films, music, and other realms of life that I otherwise would be totally ignorant of. I was branching out, again. Then, of course, were my eclectic brand of friends that were pushing me to grow in other ways. At church, I joined this 30-something bible study that had some liberal-minded brothers who were pushing the envelope on spiritual matters. They were Jeff Mason and Lonnie Woods. They became true friends and allies. Every Wednesday, that class felt like a struggle against narrow-mindedness that had big stakes. I loved it. I found myself on solid ground regarding faith, but not so solid that I closed myself off to further growth and development. Other things were shaping me, too: marriage and divorce, new professional relationships, travel, graduate school, friendships going south, new one’s emerging. and then a big one, my father’s death. And in the midst of that, another big rock type of shift, my call to ministry. As you can see, there is a lot that has gone into my becoming a Unitarian Universalist and I’m not done, yet. The process continues, as you will see. Stay with me on this journey. It’s a good ride to be had by all. Former President Jimmy Carter is dying. But, he’s doing it with an unparalleled amount of grace and poise. At his recent press conference to announce his future life plans and update the world on his cancer diagnosis, he smiled a lot and reported that he’d had the most “blessed life” that a person could have hoped for. He identified his marriage to Rosalyn as his single, most important choice. Given the choice of being re-elected to the presidency or accomplishing what the Carter Center has done over the years since he left the presidency, he’d choose the Carter Center legacy. It seems he’s fulfilled his mission, purpose, or assignment here on earth! I can’t think of a better “place” for a person to be in than that. Surely, he’s not finished living his life as fully as possible, but he’s given us a role model to aspire to. He helped me reframe my life mission and that’s where I’m going with this writing. At age 53, I see my mission as helping people learn to live out their faith commitments in the way that they believe to be congruent with their life goals and who they are. You don’t have to view the life of faith as I do, only the way you choose. We don’t need to agree on a right way, and we don’t have to try to convince each other to change to our way, either. Moreover, I’m free to bring others to my faith because I believe it’s a wonderfully, transformative tradition. And I’ll carry out my evangelism with great gusto, but if people say “no,” that is well and good for me; even better for them. What marks the change for me, in case that is not apparent, is that listening to brother Carter has given me a different perspective on my own sense of calling and personal mission. I’ve known that I’ve had the power and drive to change lives all along, but it was only semi-crystallized. I’ve gained a necessary nuance, more impetus for putting my work in the world, and a tangible deliverable needed to drive my energies. I have a new faith origin, or motivation, for my work as a faith educator. As a Unitarian Universalist minister, my personal mission has been to preach the good news of spiritual transformation through the power and activity of love. A more specific message that I tend to share is that of “interpersonal connection.” I also have a personal investment in growing the UU faithful. The latter does not seem to be an institutional goal, however. The difference now is that while I maintain the aforementioned assignments, I’m re-prioritizing my assignment to something more narrowl-focused. This coincides with the completion of my upcoming book, Mastering Your Own Faith: Growing in exemplary faith, which is scheduled for a 2016 release date. My book is all about how to carry out your own personal transformation by realizing your faith dreams by re-imagining the meaning of faith, being a part of a faith community, and engaging in spiritual practices. I’m very excited about the book. I just turned in my manuscript to my editor, Mary Benard, at Skinner House, the publishing house in Boston. Writing the book has enabled me to reflect deeply on my original faith underpinnings, to view my own personal spiritual journey from a birds-eye perspective. I’m not where I used to be. I’ve come a long way from my Christian-atheist upbringing. The fact that I’ve had the journey signals to me that others can do it. You need to do this. That is, my invitation to you is to help you find your personal faith commitments and live them out fully and confidently, which I believe is one of the most important keys to personal freedom. Living your own faith, whether it is as a UU, like me, which very few people are, humanist, Christian, Buddhist, or others, is the key to a type of freedom hard to describe, unless you have it. Most of us need some type of spiritual breakthrough to depart from our faith origins of birth, some transformational moment, peak experience, or revelatory learning. I’ve had all of these. That will be the focus of my next post. I’ll go deep into it. Until then, I’ll be keeping a close watch on the progress of Pres. Carter. I was in Ga. last week, and looking back on it, I wish had taken an excursion to Plains, Ga to attend his Sunday school class. Maybe next time! When it comes down to it, faith is about mastering our personal response to the unknown, that which we cannot foresee or know. Much of what we claim to know cannot be known as if it were a fact. But, we treat it as if it were. Examples include religious “truths, doctrines, and other non-scientific claims. There is another type of unknown that I want to consider here. In this category, I include information that we don’t know because we haven’t taken the time to explore, the ways of cultures foreign to us, and perceived differences of faith communities because we instinctively discount those who are unlike ourselves. The latter probably serves to cause more harm in the world than afflictions brought upon us by disease. I came to this reflection as I was walking through my old neighborhood early Sunday morning with Tamara and we came upon a church I’ve known since my childhood: Carver Heights Presbyterian Church in Columbus, GA. As I walked by, I recalled how foreign that church was to me during my youth. It is directly across the street from the house my paternal grandmother lived in, then my father after my parents’ divorce. Hence, I spent many years watching its members go to and fro. But, I never got to know a single one. As a young person, there was something odd about the people. They were all African-American as am I. They were normal looking. The church had a nursery and a playground, which appeared off-limits to anyone that I knew in the neighborhood. At one point, the minister and his family lived directly behind my family. But, they were still strangers…complete. I grew up attending an African Methodist Episcopal Church (AME). Most readers probably had never heard of the AME church prior to the shootings at Emmanuel A.M.E. Church in Charleston, SC. But, it has been a denomination since 1787. I also attended Baptist churches in the neighborhood five minutes away from Carver Heights. And because my family owned a funeral home, I attended boocoo other churches as a part of my work as a youth. But, I never went inside a Presbyterian church or even knew what “Presbyterian” meant. When I walked past the church Sunday morning, all of this flashed before me. As a person of faith, it seems odd now to look back on a church that was right in my backyard and realize that we forsook the most important of biblical commandments and never blinked an eye: “love your neighbor as you love yourself.” Not only was there no love exchanged, it seemed the people disdained us. They came from outside the neighborhood, by and large, and looked down upon us. The thing that really dawned on me as a passed by the church on Sunday morning with its people arriving was this: the people were not strange, we just didn’t take time to know each other nor felt any “moral imperative” to do so. Even as backyard neighbors, we lived as though the other didn’t matter. That describes what we might call the opposite of faith: certainty. But it is a misguided form of certainty and it’s dangerous. I realized that much of religion in the world exists in this same vacuum. People have no clue about the “other,” but presume the worst, the unthinkable, the ignorant, and a host of other unmentionables that create separation, strife, division, war, and death. And it’s mainly because we presume to know. The world is full of this evil force. You don’t have to look far. Just open the newspaper, turn on the news, listen to the radio, walk down the street, etc. All over the globe, people are being mistreated due to certainty. Eckhart Tolle says that this is the worse form of violence that we can commit against one another: presuming to keep others in a box of our own judgment. Those aren’t his exact words, but that is the message. Our unknowing allows us to form judgments about the “other” they don’t deserve. It’s also a disservice to ourselves because we deprive ourselves of relationships and connectedness that transforms the world. You know, this continues to be a growing edge for me. I’m more aware of my judgmentalism now and work hard to stop it in its tracks. I immediately feel bad when I realize the harm that I’m causing by judging another human being in a way that neither they nor I don’t want to be judged. Well, where am I going with this? As lame as this sounds, I believe we all need to work on this within and beyond ourselves. We could begin just by being more kind to ourselves, exercising more self-compassion. Then, we could do it with our immediate families, show them some love and respect; not presume to know them just because we live together. We might then extend care and concern to our neighbors and neighborhood churches. When I go by Carver Heights, again, I’m going inside the church and introduce myself; show them some love that I should have shown before. We ought to teach our kids and the generation that is following us to do the same. That is where true faith comes into play. We can begin living in a way that we can trust will spread through our progeny and their generation and extend to them the invitation to get to know others different from themselves and not presume to know, to be afraid, and spread fear. I wish that I could make this a little lighthearted. I’m coming up short. It’s a heavy topic. But, I know this much: if I take time to get to know my neighbor that I don’t know and pass by daily as I come and go from my house, surely, we’ll find something to laugh about. That is something that you and I can be certain about. Well, Tamara and I went to a new church on Sunday morning, a local Unitarian Universalist congregation. We felt welcomed and met a lot of new people. After the service, we spent some time with people getting to know each other in genuine conversation. Guess what? They invited us back. They invited me to come and preach! We’ll definitely return. I’ve been wondering how faith persists for emigrants who are stuck between countries. In the news lately, we’ve been hearing about the massive numbers of persons who leave their country (usually war-torn or economically-depressed) in hopes of reaching another with greater chances for a decent life. They usually have a terrible journey filled with peril. How does their faith persist under such severe conditions? I heard a story on Wednesday about emigrants holed-up in a stadium on the Greek island of Kos. There were thousands living there with scarce sources of water and few restrooms to meet basic hygiene needs. The Greek officials had locked them in! While they hoped that help was on the way, very little was coming. If you’ve ever been to Greece (I have) in the summer, you can imagine how miserable it must be for these people who are seeking asylum. It’s a tropical island. If you haven’t been to Greece, you only need to imagine a very hot day in your own environment, then imagine that you were outside for days without cover, water, restrooms, and food. You get the picture now, I hope. It’s no vacation. These are amongst the ways that my Unitarian Universalist faith might strengthen me. As a spiritual humanist, I am not inclined to put my trust in cosmic forces, though I don’t dispute their existence. On the other hand, for those who do believe in cosmic & heavenly forces, such as the God and Holy Spirit, I would absolutely encourage you to cling strongly, unflinchingly to your faith. This is my hope for those who are stuck in various outposts in the world, as emigrants, on their way to a new life. When they learn of a capsized boat, or the death of a loved one trying to reach the other side (Europe, the U.S., or democratic nations in Asia), or find themselves being swindled by a smuggler, I want them to keep their faith. Don’t give in to despair, depression, and hopelessness. That sounds easy for me to say, I know. I’m not the one suffering these inhumane conditions. Still, I offer encouragement and hope. The human spirit can prevail because it’s resilient and capable of “going through” and coming out on the other side, sometimes unscathed, albeit bruised. For those interested in how the Unitarian Universalist faith can sustain you, please reach out to me. I want to talk to you. We can sit down, or Skype, or do a Google Hangout. Just reach out. For those who are suffering in the midst of emigrating, I send my prayers, compassion, and encouragement to you. I’m there in spirit. I deeply trust and hope that all will be well.